Twenty assorted 5 x 7� blank notecards (5 each of 4 styles) with envelopes in a decorative box by Wildlife Artist, Charley Harper. Contains five each of the following notecards: Catnip, Blue Jay Patrol, Birdwatcher, and Treed. Describing his method of depicting wildlife, which winnowed out all but the most important details, Harper once said, �I see exciting shapes, color combinations, patterns, textures, fascinating behavior and endless possibilities for making interesting pictures. I regard the picture as an ecosystem in which all the elements are interrelated, interdependent, perfectly balanced . 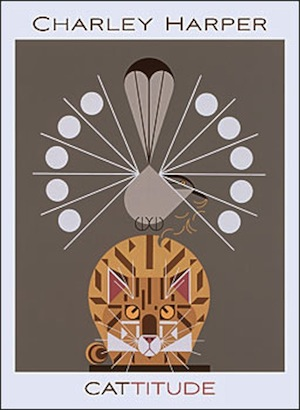 . . ; and herein lies the lure of painting; in a world of chaos, the picture is one small rectangle in which the artist can create an ordered universe.� For more than sixty years Charley Harper�s work has been treasured by art and animal enthusiasts alike.